After successfully winning her Queen’s Cup Debut with a 4th round TKO…Claire became a WPMF World Muay Thai champion on National Thai Television and around the world. Claire, a BJJ Blue Belt, who has spent time training in Brazil, is looking to make her debut in MMA. 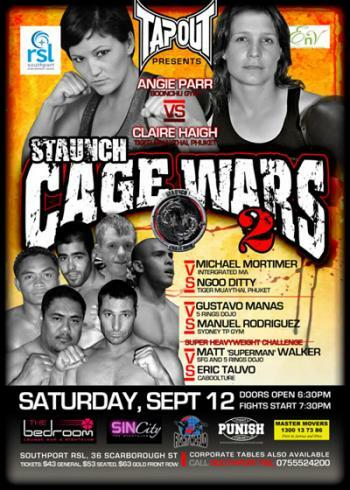 Angie Parr, wife of Muay Thai legend John Wayne Parr has transitioned her stand-up game and is also looking to make her MMA debut at Cage Wars promotion in Brisbane, Australia on September 13, 2009. These two female fighters will make for an amazing and exciting main event. Check out http://www.infinitemma.com/ for more info on the promotion and event. Also being featured in a super-fight is Tiger Muay Thai and MMA training camp’s original Thai-MMA crossover Ngoo Ditty. Fresh off the BJJ promotion to blue belt Ngoo is going up against stiff competition as he faces Fairtex Integrated MMA star Michael Mortimer at 60 kilos.